Peter Link has done it again! 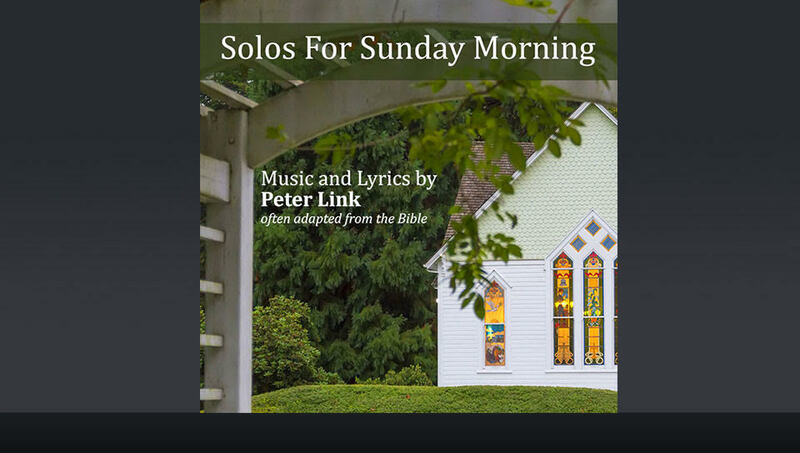 Just this past weekend, Watchfire Music released Peter’s “Solos for Sunday Morning” Song Bundle — a DSM (Digital Sheet Music) Song Collection of 13 new sacred songs for soloists to sing in their church services. Peter offers not only the digital sheet music for these new songs, but he and his Watchfire Music partner, Julia Wade, recognize the need to communicate and offer ways to help church soloists and accompanists feel comfortable negotiating contemporary music styles. So, Peter has once again produced a comprehensive set of Study Tools — Study Tracks and Accompaniment tracks for each song title. These are offered to help church musicians prepare and perform contemporary music with freedom and confidence. I have truly loved working on this book of solos. About a year ago I made the decision to dedicate a major portion of my life to the study of spirituality through the Bible. And what better way of doing this than through music. The work has been buoyant, challenging and totally fulfilling. And what a gift I have in my partner, Julia Wade, and her magical interpretations of my music! Her CD, Sunday Morning, fully orchestrated, will follow soon after the release of this book of 13 songs expressly written for church soloists around the world. These songs require consecration. They are not songs one can first pick up on a Friday and then sing on Sunday. Like anything worthwhile, they will take some time to contemplate and prepare properly — for both you, the vocalist, and your musician. I ask that you give the song time — time to gather inside of you, time to fire your being. I like to write songs with the rhythm of the spoken word and the natural feeling of the inspired moment. Consequently, the rhythms of my music are often complex and perhaps a bit tricky for some musicians. And so I very much recommend listening to the study tracks and Julia Wade’s album to feel the naturalness of those rhythms before you start to learn the songs. The notes on a page of sheet music are an approximation of the music in my heart and soul, but only that, an approximation. It’s why both Julia and I have worked very hard all these years to get off the music paper and more into the moment or total experience of the song. A song is just so much more that what’s on the page. It must be, for everyone present, an inspirational experience. When Julia sang her seven years as soloist at the First Church of Christian Scientist in Boston, The Mother Church, she would always start the work on a given song at least a month in advance. This enabled her to get inside of the song and its meanings, its rhythms, its depth. I certainly understand if your lifestyle will not permit this kind of consecration, but give it a try occasionally with these songs. I promise a rich musical and spiritual experience. Thanks for singing my songs. I write them for each of you. Also! Here is a free pdf download of information on the Solos For Sunday Morning Song Bundle — and a wonderful introduction to using the Study Tools offered with Peter’s new songs!